Offering complete services in the maintenance of trees, shrubs and cedar hedges for over 43 years. Having a specialized expertise, we are qualified to determine the needs required to improve the health and safety of your trees. Proudly serving the residents of Westmount, Outremont, Town of Mount-Royal, Hampstead, Notre-Dame de Grâce, Montreal West, Côte Saint-Luc, Verdun, Lasalle, Lachine, Ville Saint-Laurent, Dorval, Pointe-Claire, Dollard des Ormeaux, Beaconsfield, Baie d’Urfé, Senneville, Île Bizard, Pierrefonds, Roxboro and Kirkland. 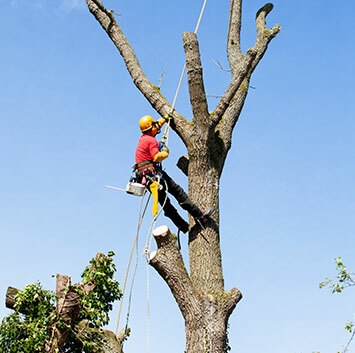 Equipped with several years of experience, we specialize in the removal of trees that are dead or in poor health. Health and safety being our top priority, tree felling is the final course of action when preservation is no longer a viable option. 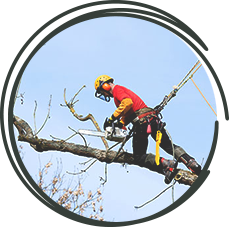 Our team utilizes the latest methods in the industry to ensure safe tree removal, even in the toughest conditions. Our modern machinery is always well maintained to ensure efficiency in our work. In addition, we have accumulated many years of experience in larger scale operations requiring the use of a crane. Above all, Hometree favours the preservation of trees that are healthy and in good condition. The primary objective of tree pruning is to maintain the health and vitality of trees. More specifically, the objective is to structure and orient the growth of young trees, reestablish the natural form, clear branches from buildings and construction sites, and eliminate potential hazards. 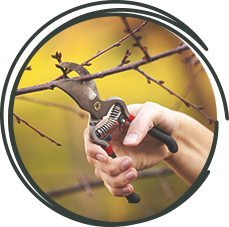 Pruning consists of removing dead, sick, weak, broken or interfering branches, and branches that pose a potential risk to the public. Nevertheless, we do not recommend over-pruning or tree topping, and our team of experts is prepared to advise you on the best course of action for tree health and maintenance. Security pruning: Pruning branches that are dead, sick, weak, or broken, to eliminate possible dangers. Sanitation pruning: Comprising of the features of security pruning, this service also involves the elimination of interfering branches, frail branches, suckers, and broken stubs. Crown elevation: Elimination of low-hanging branches with the goal of increasing ground clearance. Crown thinning: Strategically removing branches without altering the natural structure of a tree in order to promote air circulation and increased sunlight. Restructuring: Reestablishing the natural form and structure of a tree if it has been severely pruned or damaged due to topping. Building and construction clearance: Removal or reorientation of branches for clearance of streets, construction sites, buildings, power lines, and street lights. The purpose of tree cabling is to reinforce and consolidate the sections of a tree that present structural weaknesses and deficiencies. Hometree uses a synthetic cabling system that is non-invasive to the tree. 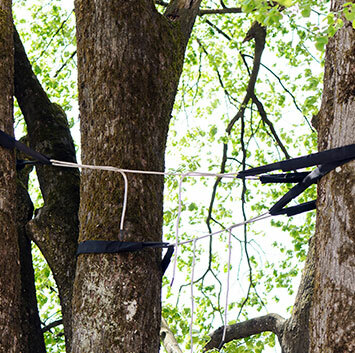 Cables are often installed to support and secure weak, damaged and/or decaying sections of a tree, and split crotches. This service aims to establish a solid form and structure in young trees. It is important to guide, maintain and orient their growth within the early years of plantation. A tree that benefits from this type of pruning at a young age will encounter less structural weaknesses and deficiencies once they reach maturity. In addition, it is necessary to orient and shape the crown of a tree while taking into consideration the constraints of the site, any potential interferences to its growth, and its natural form. 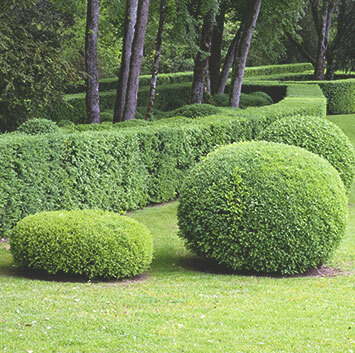 Proper care and maintenance are important factors in obtaining healthy and esthetically pleasing hedges. More specifically, watering, fertilizing and professional trimming promote healthy growth. Cedar hedges are advantageous in many ways; they increase privacy and decrease noise pollution in urban areas, among other things. It is important to shape and trim hedges regularly from a young age. Cedar hedge trimming is typically done once a year, either at the end of spring or in the fall to avoid damaging the plant during the hottest and driest periods of the year. 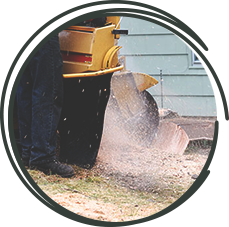 For stump and root removal, we have two stump grinders that reach 12 to 25 inches below the ground. Our smallest stump grinder measures 36 inches wide, made to fit in most backyards. Our larger stump grinder is more suitable for front lawns and very large stumps. Both stump grinders are built to prevent any damage to the lawn or other areas of the property. choose the best for your landscaping.